All credit for this post goes to Darkstorm & Demon Rin. It was originally posted in Funimation dvd discussion II. Please thank Demon Rin for frequently updating the FAQ. Q: Up to what episode has been released in FUNimation Dub format? A: Episode 456 is the end of FUNimation's "Season 7". That is the final full season that is currently available. FUNimation are also presently in the process of releasing "Season 8" which is expected to span the entire "Paramount War" or "Marineford" Arc, however, the exact breakdown of what FUNimation considers Season 8 to be has not been stated. Q: Are more episodes beyond that coming, and when? A: Yes and No. No official word has come from FUNimation regarding the acquisition of "Season 9" specifically, however sales have been steady and no indication has come from FUNimation that they intend to drop the series any time soon. So the short answer is: For now at least, it's expected the series will continue for the forseeable future. Q: What about the movies and TV Specials? A: FUNimation's original license included Movie 8 (Episode of Alabasta) and it was dubbed and released on both DVD and Blu-ray. They have also acquired the rights for "One Piece Film: Strong World", which saw release in 2013 as well as "One Piece Film: Z" which released 9/30/14. The upcoming movie "One Piece Film: Gold" which has yet to release in Japan, has also been announced as among FUNimation's intended releases, noting that they may attempt a theatrical release of this film. On the TV Special front, No older TV Specials have been released, however FUNimation has begun including TV Specials in their Simulcast of the series starting with the "3D2Y" Special, and FUNimation have indicated their intent to begin releasing dubbed versions of at least these newer specials starting with 3D2Y. No information about what format or timeframe these releases will take has been revealed as of yet. Other than the above mentioned examples, no other movies or specials are planned for release at this time. Q: In what format are the DVDs? IE: How many episodes per set? A: There are currently two release formats for One Piece. First a set of 11-14 episode "Voyages" with an MSRP of $39.98 comes out as the initial release for a given season. Then, shortly after the season finishes its run, FUNimation re-releases the series on lower priced "Collection" sets which are each comprised of two voyages in new packaging (22-26 Episodes Each). Despite this, the disc contents are exactly the same as the voyages right down to the menus. Each collection has an MSRP of $34.98, but prices may vary depending on the outlet you purchase from. Amazon has also begun putting out exclusive Collection Boxed sets with 100+ episodes per set. However, these sets are simply the above mentioned "Collection" sets packaged together 4 at a time with a new outer set casing. Thus far, the actual content of these sets has shown to be identical to the "Collections"
As the "Voyages" for Seasons 1-6 have long-since finished being released, they can still be found however prices will vary on those as some have gone out of print. Q: What episodes are available in those formats? A: The entire first 5 US Seasons (Episodes 1-336) are available in Collection format with Season 6 in the process of being re-released in that format at this time. Seasons 4-7 are at moment available in their entirety in "Voyages", with Season 8's "Voyage" release in progress at this time. The "Voyage" releases of Seasons 1-3 are now out of print and are somewhat difficult to obtain. It is not known how much longer the Seasons 4 and 5 DVDs will remain in print but it is safe to say that once a particualr season has started to see release in Collection format, you can expect the Voyage DVDs to go out of print at any moment thereafter. So if you are collecting the voyages specifically, now is your chance to buy Seasons 4 and 5 in that format before they are discontinued. Q: When should I expect the next release? A: Be sure to check different sources/outlets when you can for updates. Suggestions for areas to find these release dates as they come out include amazon.com, rightstuf.com, animenewsnetwork.com, toonezone.net, and crunchyroll.com, among others. DemonRin will attempt to keep the image above this FAQ updated with that information, however it is possible she may get behind so check elsewhere as well. Q: What about Blu-ray? Will the series ever be Re-released in HD? A: Episodes 1-206 Were produced in Standard Definition via digital ink and paint, therefore an HD Master of these episodes does not exist. For this reason, any Blu-ray that could be released of this material would be an upscale, which most Blu-ray players already do automatically to Standard Definition DVDs. For this reason, while a Blu-ray release of this material is possible, it is pretty much pointless and will not look noticeably better than a DVD release played on a Blu-ray player with Upscale. Either way, there is no information whatsoever about such a release. Q: But what about 207+ then? A: That is the point by which the series began to be produced in Native HD by Toei Animation. FUNimation has revealed in their press release that they have the 16:9 Widescreen HD masters of those episodes. Q: Then, will we get a Blu-ray of that? A: FUNimation currently doesn't have Blu-ray rights for those episodes but noted it was possible and they would be looking into the release format in the future. It is not likely Toei Animation in will give FUNimation those rights. So while it is POSSIBLE we may see a Blu-ray release eventually, currently it does not appear likely, at least in the near future. Q: But Why? FUNimation released Movie 8 on Blu-ray, why not the series? A: There hasn't been any direct information as to why Toei will not release the Blu-ray rights to FUNimation despite providing them with HD Masters, however the most likely answer is that since Japan currently does not have any form of a Blu-ray release planned for earlier portions of the series, and since Japense Blu-rays share the same regional locking code as America, this would allow Japanese fans to reverse-import the FUNimation Blu-rays, and Toei would not want that to happen. The movies, however, DO have a Japanese Blu-ray release, making it okay for FUNimation to do the same. Therefore, every One Piece film released in the US thus far has a Blu-ray release with no signs of that ever stopping. Q: Then, are there any signs of Toei releasing the series on Blu-ray in Japan? A: Yes, There is some hope in this situation as, starting with episode 575 (The first episode of a Filler arc set right before the "Punk Hazard" arc) Toei began releasing the series in Japan on Blu-ray format. This being the case, chances are good when FUNimation reaches this arc the releases may start coming out on Blu-ray. On top of this, Toei's release of ANY One Piece on Blu-ray is a good sign they are beginning to become comfortable in the format, and it is possible Toei may re-release earlier material on Blu-ray in the future. If that ever happens as well, the chances of FUNimation doing the same will increase. It should be noted that, as this is far in the future, it is not yet known if this will be the case and is mostly speculative. Q: If not Blu-ray, is there some other way fans outside Japan may get HD One Piece from FUNimation for the time being? A: Actually, yes! FUNimation recently struck a deal with [adult swim] to air One Piece on their recently resurrected Toonami block.. When viewed on the HD version of Cartoon Network, that broadcast is indeed presented in 1080p HD. If not for the network logos, it would be pretty much a Blu-ray release's equivalent in quality. Also, for subtitle watchers, the FUNimation simulcast of One Piece has been added to Crunchyroll. So any episodes available on that website are also available in HD to subscribers. Q: So, if it's POSSIBLE, then how will the Blu-rays be released when/if it happens? A: Most likely, if a Blu-ray release of the series happens it will either be a dual-release (IE: Both a DVD and A Blu-ray release simultaniously) as they have done with Dragon Ball Kai or they will do a Blu-ray/DVD "Combo Pack" with both formats in one box as they have done with Fairy Tail. Movie 8 was released exclusively on DVD but recieved a stand-alone Blu-ray release later and is currently available seperately as both formats. Starting with Movie 10 "Strong World", the FUNimation releases of the films appear to be in Blu-ray/DVD Combo packs with no sign of that changing. This may be an indicator of a potential release format for any possible One Piece TV Series Blu-ray release, but it's currently unknown if that will be the case. Q: Are FUNimation's releases Uncut? A: Yes, Absolutely no in-episode animation content has been changed whatsoever from the Japanese DVD release. Q: Are there any differences at all then? A: FUNimation has a new "Gold" logo that they use for their releases, the Logo has been replaced wherever it appears. (IE, opening and closing themes and Eyecatches) Also, the episode title cards (Reading off the name of the episode) have been rendered (accurately translated) in English and no Japanese option is available for them. * Other than that, the material is left alone. *The exception to this rule would be Movie 8. Using angles, it changes the logo and title cards to Japanese if you choose the Japanese language option. Q: What about the Opening and Ending Songs? A: All opening and ending songs are presented as originally broadcast with one exception. Before Season 4, all are dubbed in the English language track, and left entirely alone in the Japanese track. The first ending theme of Season 4, "Mirai Koukai" was skipped by FUNimation, and those episodes where it should appear instead use the next song, "Eternal Pose". The situation caught FUNimation off-guard and caused them to be unable to dub the opening and ending in time for the release of the beginning of Season 4, so at that point the English track begins to default to Japanese OP and ED music. A title card indicated they would try to correct this in the future. Q: But why did FUNimation do this? A: It was not their choice. Every time FUNimation gets a new set of episodes, everything right down to the music has its own set of rights that must be secured. Somewhere in the process, most likely with the artists, someone refused to give the rights to that song so it had to be omitted. This is a problem caused by the Japanese rights holders. FUNimation is not responsible, nor can they do anything about it. Q: They stopped dubbing the songs then? Will they ever start again? A: The title card at the beginning of the first Season 4 DVD explaining the rights issue did say that the same issue also caused them to be unable to dub the songs there, they specifically say this hindered up to episode 230. The implication was that the loss of those rights caught FUNimation off-guard and therefore they didn't expect to have to have Eternal Pose dubbed yet, and therefore didn't have the work completed yet. They did however specifically state that after episode 230, they at least intend to begin dubbing the songs again, however as of the release of all of Seasons 4 and 5 (ending with episode 336) this has proven to still not be the case. It is unknown if or when they will start dubbing the songs again, only that they would prefer to. At moment however, it does not appear likely they will begin again after this much time. Q: Is Zoro "Zoro" or is he "Zolo"? A: Zoro's name is rendered as "Zoro" in all text appearances (Subtitles, title cards, packaging etc) and spoken word (dub, special features) on FUNimation's DVDs. For some reason, his wanted poster in the Eyecatch will occasionally say "Zolo" when it appears on the first 26 episodes, but this is both an unintentional error that was corrected later and is on screen for less than one second. It can't be seen by the naked eye during a normal viewing of the series. The only way to see it is to frame-by-frame view the scene. Otherwise he is "Zoro" at all times. Q: How is the quality of the English Dub? A: This is subjective from person to person, but has received positive response from fans overall. Q: Is the translation accurate in both formats? A: Yes, the subtitles are accurate to what is being said, however nothing is left in Japanese except for honorifics and the occasional name. All words are translated to English including Devil Fruit names, attacks, Shichibukai (to Seven Warlords of the Sea) and "Nakama". The dub is pretty much completely accurate but occasionally has to make slight alterations to match Lip-flap but rarely is the meaning of anything changed because of this. Q: What about all the series-specific terms? Q: Why did those few things slip by? A: When FUNimation took over the series from 4kids, Toei (the company that animates One Piece) provided them with a "Master List of Terms" which lays out Toei's preferred terminology for use in the series. This list had major errors on it, and heavily favored using the same terms used by 4kids and Viz Manga to maintain consistency. As such, the list mentioned that they would need to use terms like "Zolo" and "Merry Go" for Zoro and the Going Merry respectively. The translator working on One Piece at the time, Clyde Mandelin got an account and posted here as "Mato" to alert us to these facts as well as to tell us that FUNimation is able to appeal these terms by requesting permission to change them from Toei directly, but have to wade through a certain level of red tape to do so. That is why most of the major terms like "Zoro" were corrected. Q: Why didn't they just correct everything then? Q:I'm hearing news about a "Broadcast Dub" possibly coming soon from FUNimation. What is this exactly? A: By "Broadcast Dub" what FUNimation is looking to do is potentially produce a dub of One Piece that releases at the same time as, or very shortly behind the Japanese Broadcast. Meaning, the same week an episode is released in Japan, a fully dubbed english language version would come out right about the same week. Q: Wow! That sounds great! When is this going to happen? A: There's no set date for when they would start this or even IF they are going to do it at all. It should be stressed that FUNimation is looking into Possibly doing this, but absolutely no concrete plans are yet in place for whether or not a Broadcast dub will be a reality or not. Q: Ok, so, hypothetically then if it were to happen, would it have the same cast as the Dub we've watched up until now? A: Yes it would, for the most part, however it should be noted that having to keep up with a Japanese broadcast schedule carries with it pitfalls and problems that normally wouldn't present. Most Western TV Shows operate on "Seasons" where there are only new episodes for so many weeks a year, with some downtime between Seasons to produce new episodes. Some anime in Japan operate this way too, but others like One Piece run continuously, and breaks are very rare. For this reason, if something were to happen such as a voice actor becoming sick or otherwise not being able to record, it's possible an actor may have to be replaced to keep up the schedule. Q: Oh... That wouldn't be too good, Does Toei in Japan do that? A: Yes actually, Chopper and Robin's voice actresses were both on maternity leave during large chunks of the Water Seven and Enies Lobby arcs. Chopper's replacement voice is most notable in Movie 7. Q: So, would they re-record for the DVDs in those cases? A: No official answer has been given on this, but it's safe to say FUNimation most likely would. Q: But wait, I ONLY watch One Piece dubbed, so I've only seen what FUNimation has released on DVD thus far... won't it take a long time before FUNimation catches up with the Japanese broadcast? A: It was stated during the One Piece Podcast interview that dropped this news that if FUNimation decides to go ahead with the Broadcast dub, that they would expedite their releases of the earlier material to bridge the gap in a much quicker amount of time. Q: I really like this idea! Is there anything I can do to help make it happen? A: Josh Kocurek, the FUNimation representative that first announced these potential plans has stated that the possibility of doing this hinges on several factors, one of which being whether or not the support exists for such a thing. You, in fact, can help by showing that support! Any Twitter users can send a Tweet with the hashtag #OPBroadcast to Josh on Twitter. to let him know. Don't have Twitter? Direct the same hashtag to FUNimation's Facebook page. Q: Where besides America is the FUNimation Dub available? A: Canada also uses Region 1 DVD codes, therefore the FUNimation DVDs sold in America are also sold in Canada and will play in Canadian DVD players without modification. Outside that, FUNimation themselves do not distribute DVDs in other regions, but their dub is used in some international releases including Madman Australia's and Manga UK's. Q: What Format are the episodes being released in? A: The primary release format in this version matches FUNimation's "Voyages" release exactly right down to the use of the exact same cover art. (See the above FAQ for more info) The only difference is that while FUNimation refers to their releases by "Season X Voyage X" Madman simply calls them all "Collections" and numbers them sequentially, meaning the first set of FUNimation's "Season Four" is just called "Collection 17". Q: But if they're doing the "Collections", does that mean they have (around) 26 episodes per set? A: As said above, they emulate the "Voyages" exactly, therefore they have 11-14 episodes each as stated above in the break down of the voyages. Madman simply decided to call their release "Collections" and actually did so before FUNimation decided to call their re-release "Collections". It's simply an unfortunate naming decision that potentially creates confusion. Q: So, do Madman have any kind of re-release of the series? Is it equivalent to the FUNimation "Collections"? A: They have re-released the series in bigger boxed sets however they went an entirely different route than FUNimation decided to. Instead of 22-26 episode sets as FUNimation are doing, Madman decided to repackage the first 16 volumes (3 FUNimation Seasons) into two massive boxed sets called "One Piece Treasure Chests 1 & 2" Containing 103 and 102 episodes respectively. A picture of them can be seen here. Q: Are there any appreciable differences between the FUNimation release and the Madman Release? A: None has been discovered at this time. They appear to be completely identical besides Madman's name and logo appearing at some logical places on the packaging and credits, as well as the DVD Region obviously matching Australian Standards. Q: How far behind FUNimation is Madman? A: As of June 4th 2016, Madman will be caught up to the end of FUNimation's "Season 7" releases with the Australian "Collection 36" equating to FUNimation's final volume of Season 7. When Season 8 beings to be released, barring delays, Madman seems to consistently keep one volume behind FUNimation, therefore you can reliably expect Madman to have each volume finished around the same time FUNimation releases their following volume. 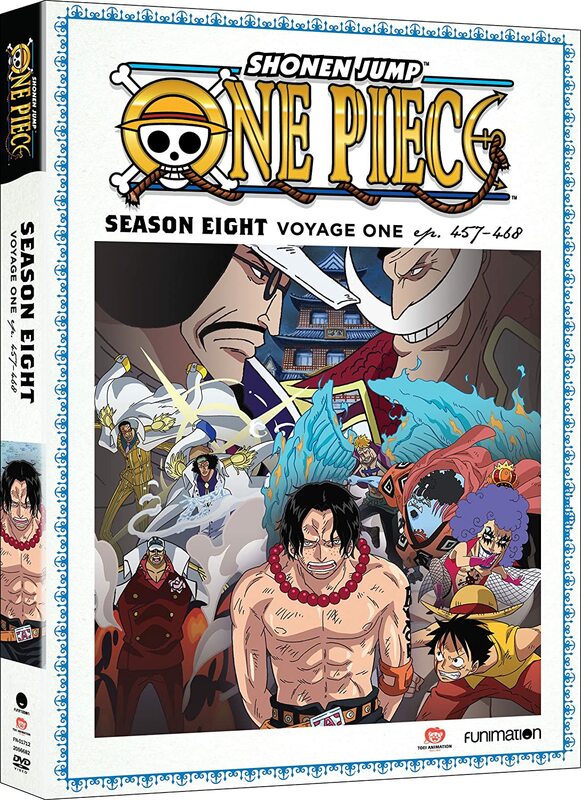 IE: After One Piece "Season 8 Voyage 1" comes out in America, expect Madman's equivalent release, "Collection 37" to come out roughly the same time, or shortly after "Season 8 Voyage 2" comes out in the US. Q: What about the Movies? A: Madman pretty much follows FUNimation's lead on everything. As such, they also have a release of Movies 8, 10 and 12, "Episode of Alabasta", "Strong World" and "Z" repsectively at this time. No word has yet been given on what they plan to do with Movie 13, "Gold", "One Piece Film Z" that FUNimation announced for release in September 2014 but it would be fair to assume Madman will want to release it some time after FUNimation makes their release in America. For reference, "One Piece Film: Strong World" was released by FUNimation on November 19, 2013 in the US while Madman's release occured on February 19th, 2014 to give an idea about Madman's past turnaround time on movie releases. Q: Australia doesn't have our own version of Amazon, where should I order the DVDs? A: If you look, you can find plenty of online retailers, however I would recommend JB Hifi's website. Q: What episodes are available? A: The first twelve collections have been released, containing episodes 1-299 in total, and can be purchased at Amazon.co.uk right now. Collection Thirteen (episodes 300-324) is released. Q: What's the release format (Episode count) on these Sets? A: Content wise they are identical to FUNimation's collections, including the logo/text changes. Other than the packaging, the only apparent difference is being in PAL format and removing the 'Marathon Play' feature. Q: How does the picture quality compare to Funimation's release? A: The UK DVD releases are in PAL rather than NTSC. The conversion from NTSC to PAL involves either blending/removing frames, causing a visible judder in movement (used on TV Collection One and Movies 1-4) or speeding up the footage by 4%, which is visibly undetectable but can a distracting change to the soundtrack (TV Series Collections 2-13, movies 5+). The speed up method is almost universally used when converting feature films to DVD or UK TV, and the majority of viewers don't notice. PAL also has marginally higher resolution than NTSC, which theoretically applies to all the HD footage (Episode 207+ and the movies). TV Series Collection Fourteen onward will be released in NTSC, which will presumably be an identical copy of Funimation's encoding. The Blu-ray releases are the same 1080p24 format in both countries, with no conversion required. Q: What about the Movies? Is there any news on a release of them? A: Surprisingly better news than America! Manga UK has released 11 of the 12 One Piece films in the UK. This includes DVD/Blu-ray releases of Movies 8 (Episode Of Alabasta), 10 (Strong World) and 12 (Z), and three DVD-only three-movie collection containing films 1-9. Manga's releases are missing some features compared to the US versions (the 5.1 surround tracks for Movie 8 and the special features for Movie 12). Manga UK refers to Z as "Film 11" rather than 12, suggesting that they have no plans to release Japanese Movie 11 (Straw hat Chase). Q: Wait, if the Dub is produced by FUNimation in America, what does that mean for the inclusion of a dub as part of this release? A: FUNimation have thus far only tackled 3 of the One Piece movies, Movie 8 "Episode of Alabasta", Movie 10 "Strong World" and Movie 12 "Z". Accordingly, these movies contain both the English dubs and Japanese audio on Manga's release. Movies 1-7 and 9, however, contain the Japanese version with English subtitles only. 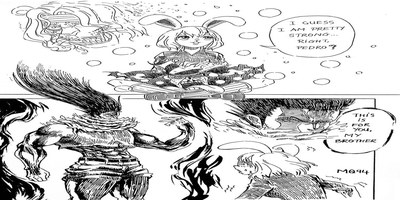 Unfortunately, Manga's translations have been criticized for containing typos, inconsistent terminology with Funimation's translations and a noticeable unfamiliarity with the series. Movie 8 uses Manga's own translation, rather than Funimations. Q: So.... Will UK fans ever get a dub of these films then? A: Manga UK has yet to make any comment on the hypothetical situation of what they would do if/when FUNimation finally produces dubbed versions of these films. The fact that they include the FUNimation dub in every instance it is available shows they would prefer a dub be included in their releases, so it's a fair assumption that when those assets become available, Manga UK may want to include them in a future re-release of the movies. In a similar situation, Manga released the series 'Blue Exorcist' as Japanese/subtitled DVDs before an English dub was announced, followed by a Blu-Ray-only "Definitive Edition" with English and Japanese audio once a dub was available. Last edited by Zephray; March 14th, 2016 at 02:49 PM. the first question needs to be updated. Thank you for making a new thread. Its not the first question, its the whole FAQ that needs an update (which we see hasn't been touched in over a year). Though I can't remember the last time someone came around looking for FAQ answers anyway. A: Episode 336 is the end of FUNimation's "Season 5". That is the final full season that is currently available. FUNimation are also presently in the process of releasing "Season 6" which spans the entire Thriller Bark Arc. This season encompasses Episodes 337-384, and started being released September 30th 2014. So far, 3 volumes have been released with the fourth and final volume set to arrive April 7th 2015, which will include episodes 373-384, finishing up the Thriller Bark arc. A: Yes, FUNimation have announced acquisition of "Season 7" which will include the Sabaody Archipelago, Amazon Lilly, and Impel Down arcs split across 6 volumes. The release of the first volume is tentatively slated to be Summer 2015. A: FUNimation's original license included Movie 8 (Episode of Alabasta) and it was dubbed and released on both DVD and Blu-ray. They have also acquired the rights for "One Piece Film: Strong World", which saw release in 2013 as well as "One Piece Film: Z" which released 9/30/14. Q: Wait, I read somewhere that FUNimation's "Season 6" was originally supposed to include up to the end of the "Impel Down". Is this true? A: When Season 5 was announced, it appears as though the official text press release from FUNimation included an announcement of "Season 6" and "Film Z" and was very specific about the episodes in that season, indicating it would end at the end of the Impel Down arc. As it was in the email press release sent to most news sites, so many of them began running that information despite FUNimation not actually announcing any of that at the official panel. Everyone later made corrections, removing that part of the information due to FUNimation recanting it and claiming it was a mistake. At the time the mistake occured, there was no official announcement whatsoever for "Season 6". They did eventually announce a release of Film Z as well as the actual Season 6. That announcement stated Season 6 as being only the Thriller Bark arc with no mention of anything beyond that until the announcement of Season 7, which does indeed go to the end of Impel Down. As the "Voyages" for Seasons 1-3 have long-since finished being released, they can still be found however prices will vary on those as they have gone out of print. A: The entire first 4 US Seasons (Episodes 1-263) are available in Collection format with Season 5 presently in the process of being re-released in that format at this time. Seasons 4 and 5 are at moment available in their entirety in Voyages. The "Voyage" releases of Seasons 1-3 are now out of print and are somewhat difficult to obtain. It is not known how much longer the Seasons 4 and 5 DVDs will remain in print but it is safe to say that once a particualr season has started to see release in Collection format, you can expect the Voyage DVDs to go out of print at any moment thereafter. So if you are collecting the voyages specifically, now is your chance to buy Seasons 4 and 5 in that format before they are discontinued. A: Canada also uses Region 1 DVD codes, therefore the FUNimation DVDs sold in America are also sold in Canada and will play in Canadian DVD players without modification. Outside that, FUNimation themselves do not distribute DVDs in other regions, but their dub is used in some international releases including Madman Australia's release of the series and recently Manga UK's announced release. A: None has been discovered at this time. They appear to be completely identical besides Madman's name and logo appearing at some logical places on the packaging and credits. A: As of July 23rd 2014, Madman is completely caught up to FUNimation's release with the Australian "Collection 27" equating to FUNimation's final volume of Season 5. When Season 6 beings to be released, barring delays, Madman seems to consistently keep one volume behind FUNimation, therefore you can reliably expect Madman to have each volume finished around the same time FUNimation releases their following volume. IE: After One Piece "Season 6 Voyage 1" comes out in America, expect Madman's equivalent release, "Collection 28" to come out roughly the same time "Season 6 Voyage 2" comes out in the US. A: Madman pretty much follows FUNimation's lead on everything. As such, they also have a release of Movies 8 and 10, "Episode of Alabasta" and "Strong World" repsectively at this time. No word has yet been given on what they plan to do with Movie 12, "One Piece Film Z" that FUNimation announced for release in September 2014 but it would be fair to assume Madman will want to release it some time after FUNimation makes their release in America. Q: Is Manga really releasing One Piece in the UK?! A: Yes! It is true! Manga announced that they will be releasing the FUNimation dub of One Piece in the UK! Rejoice~! A: The first six volumes have been released collecting episodes 1-156 total and can be purchased at Amazon.co.uk right now along with the ability to pre-order the next set which releases August 11th, 2014. A: They appear to be emulating FUNimation's "Collection" sets exactly right down to the cover art. The only apparent difference based on an unboxing is that they appear to be using the original Blue One Piece Logo instead of FUNimation's Gold one, and have completely different disc art on the actual DVDs themselves. Other than that, no other differences have yet come to light. Manga UK has announced they will release the first 10 One Piece films in the UK! As FUNimation's most recent release at the time of that announcement was Movie 10, One Piece Film: Strong World, Manga UK started with that film and it is already available on DVD and Blu-ray. The previous 9 films have been announced to be released on 3 boxed sets with 3 films on each. The first containing movies 1-3 will be out July 28th 2014 with the second set containing movies 4 - 6 coming out September 8th 2014. No information is yet known about the third set, other than it is definitely announced for release! Manga UK has also yet to make any plans to release any movies past Movie 10. A: FUNimation have thus far only tackled 3 of the One Piece movies, Movie 8 "Episode of Alabasta", Movie 10 "Strong World" and Movie 12 "Z". Accordingly, the release of "Strong World" made by Manga UK uses exactly the same assets and packaging as FUNimation's stand alone release, including the FUNimation dub being included. It was also stated in the press release by Manga UK, that Movie 8 will also be dubbed in their box-set release that includes it. When it comes to the other movies in the series however, FUNimation has yet to tackle any of them so at moment, US fans have no information on when a dub of those films will be produced. As such, no dub will exist in time for Manga UKs DVD release of these movies, so Manga UK has decided to forego a dub on these releases. The sets have brand new packaging and menues produced by Manga UK as well as English subtitles for the release. A: Manga UK has yet to make any comment on the hypothetical situation of what they would do if/when FUNimation finally produces dubbed versions of these films. The fact that they include the FUNimation dub in every instance it is available shows they would prefer a dub be included in their releases, so it's a fair assumption that when those assets become available, Manga UK may want to include them in a future re-release of the movies, but at moment as dubs of those movies are not even on the horizon for FUNimation, Manga UK has yet to make any comment on the issue one way or the other. So who think Usopp is inside that duffelbag? Amazon got the first cover of Season 8 up. It's a nice cover to start the season with. Last edited by Sano; March 10th, 2016 at 12:36 AM. Great cover! And not quite as messy as the last one. Can't wait for the shorter release schedule. Will update the FAQ while near a computer tomorrow (always comment here on my phone). Cover looks really good and I see they're using the new FUNi logo now. I wonder when they're going to put up the acquisition announcement for Season 8. Also freaking beautiful! This is why I'm a One Piece fan when it comes to seeing new stuff from Funimation. I'm NOT a doggy. I am a creature from another world. LOVE the cover. I'm still in shock we're finally coming to Marineford in the dub. Last season before the time skip,oh how long have we come. Remember when were dreading that we might not get anything after season 3? I can update the rest of the FAQ myself considering I wrote it in the first place. Gimme a few minutes and I will. Sorry I've been behind on this stuff, real life got in the way. Also, I left the Manga UK section alone as it's already been updated, but included it in the above to make copy-pasting it easy. Last edited by Demon Rin; March 11th, 2016 at 12:09 PM.